1 Rinse the potatoes and cook for 20-25 minutes in boiling water. Then drain, rinse under cold water, peel and let cool. 2 Cut cooled potatoes into slices, season with salt and place in a bowl. Peel the onion and chop finely. 3 Boil the diced onion with apple cider vinegar and broth in a small pot, then pour over the potatoes while hot. 4 Add oil and toss to combine. Let stand for 30 minutes, mixing occasionally. 5 Rinse lamb's lettuce thoroughly and spin dry. Rinse chives, shake dry and cut into small rings. 6 Rinse apple, remove seeds and cut into thin strips. 7 Cut the prosciutto into thin strips. 8 Season potato salad to taste with salt and pepper. 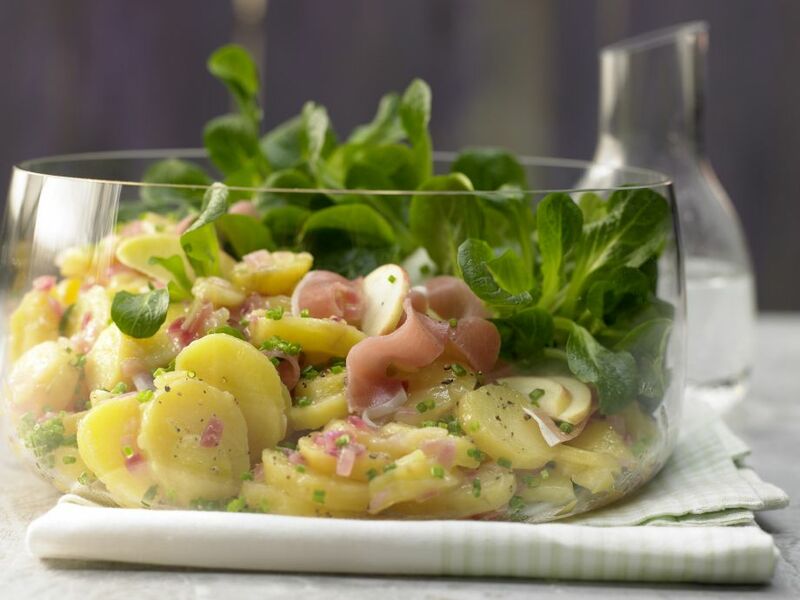 Add lamb's lettuce, chives, prosciutto and apple slices to the salad and mix thoroughly before serving.